Brain It On: The Wood Trucks is another physics-based puzzle game developed by Stickman Shooter. 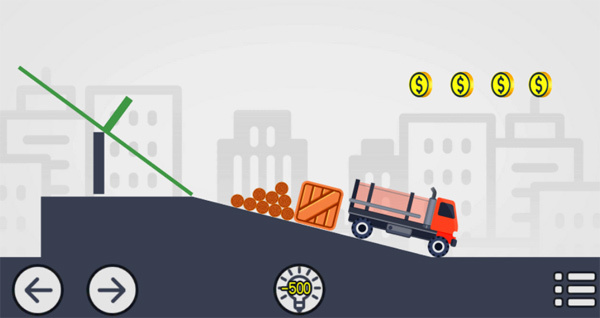 Your objective is to load the rocks into the truck in each level. Build shapes with your crayon in a smart way and challenge the physics laws in many situations. Any design that you draw become physical objects that can interact to physical objects in the game. The game is suitable for all types of ages, there are 85 levels in map 1. If you get stuck in the game then check out the video walkthrough for the game. This entry was posted in Android Games, iOS Games, Mobile Games, Walkthrough and tagged Brain It On: The Wood Trucks, Brain It On: The Wood Trucks Answers, Brain It On: The Wood Trucks Cheats, Brain It On: The Wood Trucks Gameplay, Brain It On: The Wood Trucks Help, Brain It On: The Wood Trucks Hints, Brain It On: The Wood Trucks Map 1, Brain It On: The Wood Trucks Review, Brain It On: The Wood Trucks Solutions, Brain It On: The Wood Trucks Tutorials, Brain It On: The Wood Trucks Walkthrough by Marvin. Bookmark the permalink.